Hanoi (VNA) – The confederations of Labour of central Binh Thuan and Quang Ngai provinces presented 1,000 national flags to members of commune-based Fishery Trade Unions in Ly Son Island district, on August 1. 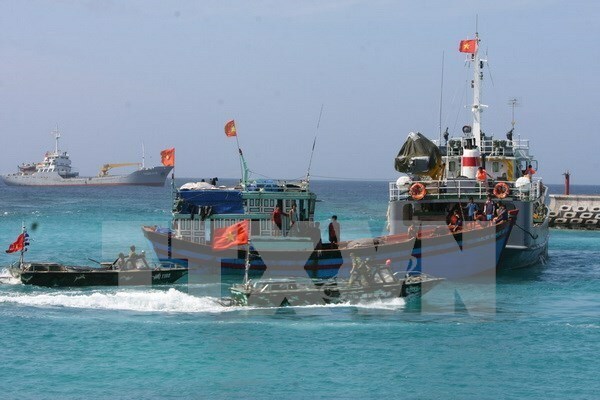 The flags were given to the fishermen in response to a national campaign to support Hoang Sa (Paracel) and Truong Sa (Spratly) archipelagoes in 2017. The event aims to motivate local fishermen to continue fishing offshore, affirming the country’s sea and island sovereignty.